MAN Diesel & Turbo has won the order to supply Danaos Shipping Co. Ltd. with fixed pitch Kappel propellers, propeller boss caps with fins, and Engine-Power Limitation for two container vessels – the 8,500 TEU ‘CSCL Europe’ and ‘CSCL America’. Mr. Dimitrios Vastarouchas, Technical Director & Deputy Chief Operating Officer of Danaos said: “At Danaos we look forward to have the vessels upgraded. Our R&D Department has conducted very thorough investigations before concluding what the right upgrade solutions for these vessels are and we are confident that the vessels will be highly competitive in the market once upgraded”. Both container vessels are powered by MAN B&W 12K98MC-C main engines rated at 68,520 kW at 104 RPM. In connection with the propulsion upgrade the main engines will be limited to 44,000 kW at 89.7 RPM however; top speeds of more than 23 knots will still be available. Along with the upgrade of their propulsion systems, the vessels will also enter dock to rebuild their bulbous bows. Combined with the already installed Turbo Charger Cut Out these comprehensive upgrades are expected to reduce fuel consumption at the new optimization speed of 18 knots by a total of more than 15% compared to the vessels as they were delivered from the new building shipyard in 2004. The upgrade packages will make the Danaos container vessels among the most competitive mid-size container vessels in the market. Most mid-size container vessels were often originally designed and build to operate at much higher speeds than it is the case today and accordingly, their propulsion characteristics can be optimised. To this end, MAN PrimeServ’s Retrofit & Upgrade Departments in Copenhagen and Frederikshavn started up a ‘Vessel & Engine Specific Study’ in 2015. The project researched 12 different potential solutions for optimising propulsion using diverse MAN Diesel & Turbo technologies and products individually and in various combinations. Concurrently, Danaos ran some 35 concept studies on the optimisation of its vessels at their in-house R&D department before concluding on how to proceed. Before the final choice of solution was made, exhaustive CFD-simulations and model tank tests were also carried out at the Krylov State Research Centre (KSRC) in St. Petersburg, Russia. Besides verifying the performance of the new Kappel propellers and the new bulbous bow design a primary reason for carrying out model tests was also to ensure that the new propellers for the CSCL Europe and CSCL America would have the correct light running margin (LRM). A temptation with optimisation projects can be to deliberately reduce the LRM below the optimal in order to give the propellers a slightly higher efficiency. Ultimately, a propeller layout with a reduced LRM will however be at the expense of the engine’s SFOC whereas the full potential of the propulsion upgrade will not be exploited in full scale. Instead, the philosophy at MAN Diesel & Turbo is to avoid looking at individual components alone and to look at the complete propulsion drive train in a holistic fashion where components are viewed in terms of the mutual influence they have on each other. Apart from the new Kappel propeller and propeller boss cap with fins – both designed for the reduced engine output – the container vessels will also, while in dock, have their bulbous bows altered to a design that better matches their future operation profile – an operation popular known as a ‘nose job’. The new propellers will be of the highly efficient Kappel design from MAN Diesel & Turbo. The unique design of the Kappel propeller with its forwardly swept propeller blade tips reduces the tip vortex and consequentially the drag of the blades trough the water. An additional effect of the Kappel design is lower pressure pulses induced to the hull allowing a smaller clearance between the hull and propeller blade tips. As a result of this the propeller diameter can be enlarged which increases the efficiency of the Kappel propeller even further. The Kappel propeller design concept was originally developed by the Danish inventor Jens Julius Kappel and after a decade of close cooperation overtaken by MAN Alpha at Mr. Kappels retirement. Combined with the knowledge from MAN Alphas more than 100 years of propeller design and refined to today’s concept the Kappel propeller design is among the most efficient propeller designs in the world. With a diameter of app. 9 meters the 5-bladed propellers will be the largest fixed pitch Kappel propellers delivered to date. They will be manufactured by MAN Diesel & Turbo licensee, Zhenjiang Tongzhou Propeller Co. Ltd in China along with the new propeller boss caps with fins – an efficiency improving device for reducing the hub vortex and drag behind the propeller hub. The new Kappel propellers and propeller boss caps with fins contribute with an efficiency gain of 6% which can be directly transferred to reductions in fuel oil consumption and emission. Kjartan Ross, Business Development Manager of MAN Diesel & Turbo said: “I started my carrier in the maritime industry in 2004 – same year as these vessels were delivered. Taking the fairly high top speed of more than 23 knots still available after the upgrade into consideration I am continuously impressed by how much technology has leaped forward in the maritime industry just during these last 12 years”. The propellers will be delivered directly to the shipyard where installations of the new propellers and bulbous bows have already been tentatively scheduled for July and September 2016. Engine Power Limitation (EPL) is a simple way of reducing the power output of the engine by changing the governor settings. Indirectly, EPL has a fuel oil saving effect as a reduced power output can have a positive effect on others efficiency improving initiatives such as propeller upgrade and engine tuning. As an example the Kappel propellers in this upgrade have been designed for a reduced engine power of 44,000 kW at 89.7 RPM whereas a limitation of the power output is needed. 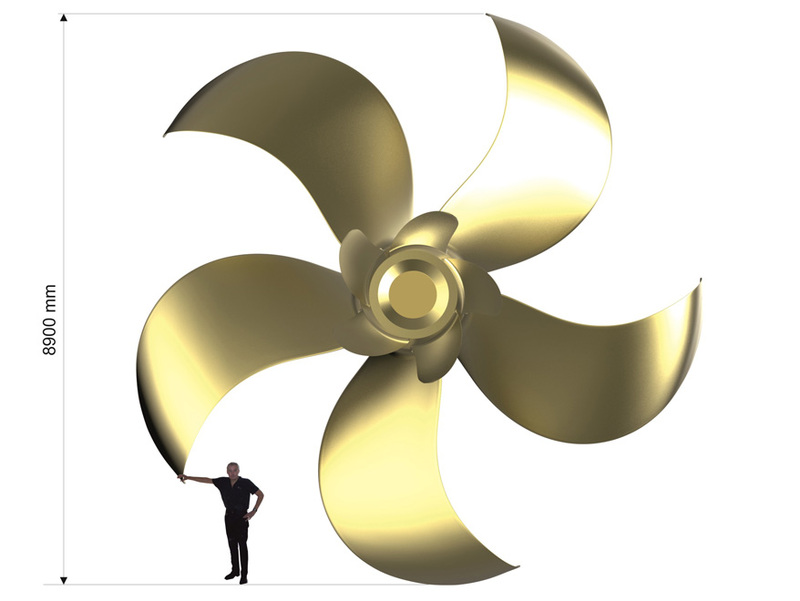 By doing so the Kappel propeller can be optimized better for the new optimization speed of 18 knots adding additional fuel oil saving to the upgrade package. Combining EPL with a propeller upgrade does however not only enable a better optimization of the propeller efficiency; it also allows weight reductions of the propellers and hence reduces both the propeller cost and the overall cost of the upgrade package. Vessel and engine upgrades often have an impact on torsional vibration and NOX. When a low-load tuning method such as a Turbo Charger Cut Out or a propeller upgrade is installed, the torsional vibrations’ impact and the NOX level have to be taken into account to ensure that the vibrations’ impact is not harming the propulsion drive train and that the NOX level is in compliance with IMO regulations. All the required calculations and class approvals are included in the MAN Diesel & Turbo upgrade package.